There has been a lot of new information on processed foods, seed oils high in omega-6, refined sugar, as being the cause of bodily inflammation. We have also read about lowering our carbohydrate intake, as too much carb’s over works the pancreas and heightens insulin levels. Refined grains is the big culprit to weight gain. Refined grains digest fast and causing rapid use of glucose or a spike of sugar levels in the blood stream, causing the body to store the excess sugar not used, as fat. But what about whole wheat pasta? Or better yet 100% whole wheat pasta? When consumed, can it be to blame for weight gain as well? No!! When the fiber is not taken away from the grain, but processed together, is actually better for the body. Fiber causes food to digest slower and at the same time move faster through the digestive tract. As the whole grain pasta is digested, it releases a stead flow of glucose (not all at once as does white pasta without the fiber) giving sustained energy. The fiber then pushes the digested food out, not being stored as fat. A 1-cup serving of cooked whole-grain pasta contains 3.9 total grams of fiber, while the same amount of white pasta contains 2.3 grams. It is also worthy of noting, that whole grains lower blood pressure, were as grains with the fiber removed can cause blood pressure to raise. For the vegetables, I just buy them fresh frozen from the Whole Foods Market. You can use a jar of Alfredo Sauce, but I make my own. Heat a small sauce pan, medium-high. Add butter and melt, not allowing to scorch, next add cream and stir while pouring. After the two are well incorporated, add grated cheese and mix in as it melts. Bring to a small rapid bowl, remove from heat and set aside. Some Al Fresco brand sausages you can buy already cooked and at some markets they package it fresh, uncooked. Al Fresco is my preferred brand, as it is minimally processed and no preservatives added. Click on image to go to their web-site to receive a $1.00 coupon off. I have been buying the package at about $3.50 to 3.99. I prefer to buy the fresh uncooked sausage. In a large skillet, cook sausage over medium-high heat. Let sausage crumble to small bits. Add Alfredo sauce, cooked pasta and vegetables. Stir until all are mixed well together. We had an Italian Rustic Bread loaf and melted provolone cheese on slices of the bread. Wow what a great addition to the plated pasta. 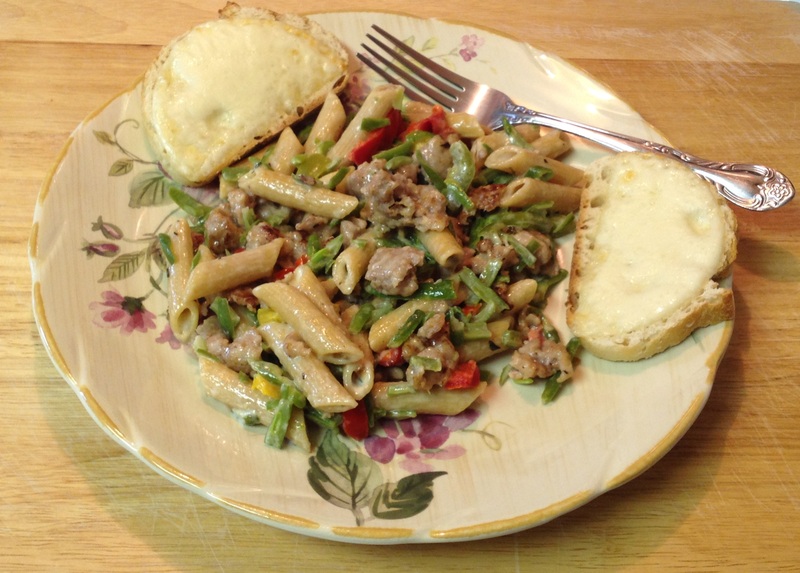 This entry was posted in Chicken, Main Dish, Pasta and tagged Alfredo sauce, Barbecue chicken, blood pressure, Bread, Cook, Cream, Fettuccine Alfredo, Pasta, Penne, Penne pasta, Sausage, Whole Foods Market, Whole grain, Whole Wheat Penne Pasta. Bookmark the permalink. Excellent point of view on the healthy factors of pasta. 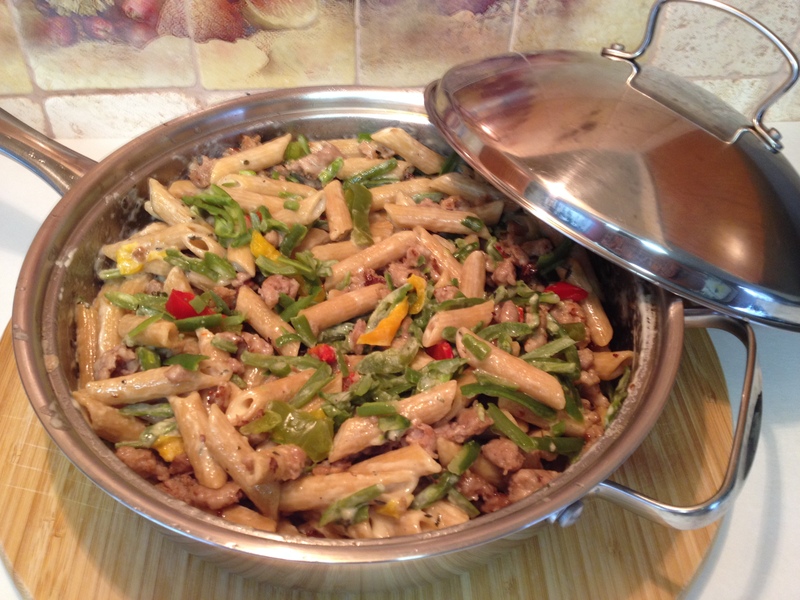 This looks like an excellent weeknight pasta dish to serve the family. I also have noted for myself personally, I don’t feel as full or bloated when I eat wheat pasta, as one can with white pasta.